The All-on-4 solution is designed for patients who have limited amount of bone in the jaw. All-on-4 is an alternative dental implant solution that maximizes the use of available bone for immediate use using just four implants! The All-on-4 technique has a 98.5% success rate at the four-year follow-up and has been provided to patients for over ten years. 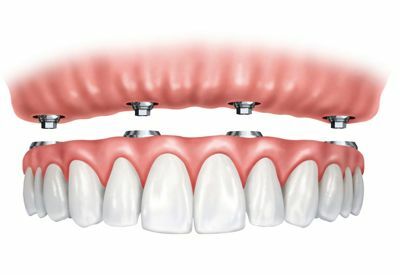 The All-on-4 technique is specifically designed to use only four implants that are available for immediate function. All-on-4 dental implants do not typically require bone grafting, so they are an ideal solution for patients with areas of low bone density or volume.